Can a Fiberglass Architectural Handrail System Be Viable for Residential Purposes? 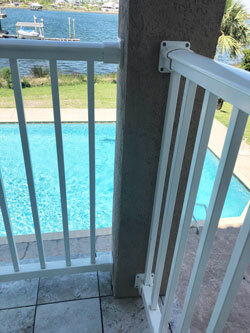 A private homeowner recently selected STRONGRAIL® to replace traditional porch railing at his multi-storied beach residence near Pensacola, Florida. The homeowner, who had previous experience in the commercial performance of pultruded fiberglass, wanted a residential/commercial option for his porch railings. He chose STRONGRAIL® because of the fiberglass handrail’s engineered wind-load strength, durability of finish, and attractive appeal to designers, architects, and builders. In this particular instance, the homeowner chose the 3" rounded top rail with 1" square picket system to wrap around each of the two enclosed porches. This particular system can handle wind loads of 30psf (applied as a concentrated load to the top of the post). The low-maintenance STRONGRAIL® handrail is a cost-competitive option compared with traditional materials in areas with high rates of exposure to ultraviolet rays and humidity. This is because STRONGRAIL® requires virtually no maintenance. Although a prevalent residential fencing material, the more traditional option of PVC lacks strength and durability within marine environments. In many coastal applications, lumber is prescribed as the material of choice. The exposure to saltwater and direct sunlight creates splints, warps, and even requires users to adopt a preventative maintenance regimen of repainting/staining on a regular basis. Even steel and aluminum systems succumb to oxidation, discoloration, and pitting with constant exposure to humidity, heat, and brackish air. 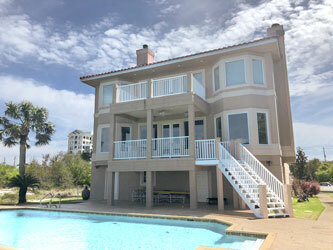 Since its installation in 2017, the homeowner has been extremely pleased with the performance and overall aesthetics of STRONGRAIL® at his coastal residence. Click here, to view the case study in its entirety.